UNITED NATIONS, New York/HOMS, Syria – Motherhood should be a time of joy, but for too many women, it comes with something else: peril. "Becoming a mother and having a family was always a dream of mine. 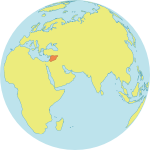 But I never expected it to happen in these circumstances," Fatima told aid workers in Homs, the conflict-affected governorate in Syria. She and her husband, Essam, fled brutal violence in Palmyra last autumn, when she was less than three months pregnant. 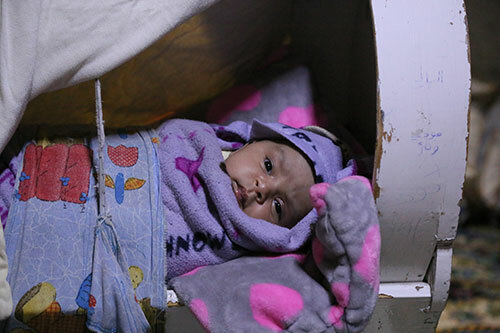 They settled in shelter Homs, where they struggled with the persistent insecurity, as well as unemployment, poverty and limited access to health services. As her pregnancy progressed, she grew frail. This coming Sunday, dozens of countries around the world will observe Mother’s Day. It is a day to celebrate mothers everywhere, but also a moment to reflect on the risks that too many women still encounter on their journey to motherhood – and what can be done about it. Despite decades of commitments by governments and leaders, mothers continue to die in massive numbers from entirely preventable causes. An estimated 303,000 women died in 2015 of pregnancy- and childbirth-related complications, the vast majority of which were preventable or treatable. This amounts to one maternal death every two minutes. Ninety-nine per cent of these deaths occurred in developing parts of the world, a combination of under-resourced health systems, poor infrastructure, and lack of priority given to women’s health and rights. Women in humanitarian crises and fragile settings face some of the greatest barriers to life-saving health care. A dramatic increase in maternal deaths is often seen during conflicts and disasters, and even in the aftermath of humanitarian crises. Data show that just 35 countries considered to be fragile, crisis-affected or crisis-prone account for almost two thirds of all maternal deaths. Fatima was at risk of becoming one of these grim statistics. The Syrian crisis has been devastating for civilians. An estimated 6.3 million people are internally displaced, and mass movements of civilians are continuing, and in some cases intensifying. Vulnerable women are paying a particular toll. An estimated 4.1 million women and girls of reproductive age are affected by the crisis – including 360,000 pregnant women. All of these women and girls require sexual and reproductive health care, services that include check-ups, health information, family planning and antenatal care. Yet the conflict has interrupted access to these vital services. Fortunately, Fatima was able to get help. Her new neighbours urged her to visit a UNFPA-supported medical clinic. There, she was found to be severely underweight and lacking in essential vitamins and minerals. At first, she felt guilty for being weak. “What if I give birth to a sick baby?” she worried. Over time, Fatima’s health showed steady improvement. Six months later, at the clinic, she delivered a healthy baby boy, whom she named Jad. Around the world, UNFPA supports sexual and reproductive health care, with a special focus on providing care to women and girls in humanitarian emergencies. 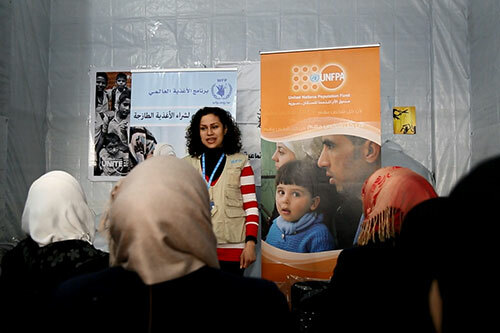 UNFPA and its partners deploy mobile clinics, trained health professionals and life-saving health supplies, helping women to safely manage their pregnancies and give birth in some of the most harrowing settings. Still, much more is needed, including strengthened health systems and increased access to sexual and reproductive health services for all people, especially those in crises. Fortunately, for Fatima, the threats have subsided – at least for now. She continues to receive the WFP food vouchers, which are helping her stay healthy while nursing little Jad, and she gets postnatal care from the UNFPA clinic . “I have been eating and breastfeeding without any trouble,” she said. She makes it a habit to refer community members to both UNFPA’s and WFP’s services, which she says have helped alleviated some of the financial strains on their family. “My husband Essam and I are now able to spend what little money we have saved to buy diapers and clothes for Jad,” she said, smiling.